Please Contact our office or Request A Quote today, to discover how we can assist with your legal requirements. Registered against the Certificate of Title to give notice of a person’s interest in that property. A caveat prevents registration of other interests on Title. (A Purchaser’s Caveat automatically lapses when the Transfer into their name is registered). The Certificate of Title is issued by the Registrar of Titles. It contains a unique Volume and Folio number that identify it and states who owns the land. This form authorises a conveyancer or lawyer to act as their client’s agent and to sign electronic or paper conveyancing transactions on their client’s behalf. The form is compulsory for electronic transactions and paper transactions from 1 January 2018. This is a written contract between the Buyer and Seller. It contains the main terms such as: the property address, the purchase price, relevant dates and the names of the Buyer and Seller. Once the buyer and vendor have agreed on a price, the Real Estate Agent will then draw up a Contract of Sale. The Contract of Sale can include special conditions that the purchaser specifically requests. These may include a building inspection or pest inspections. If there is a finance clause the buyer must demonstrate that they have a written home loan approval by a defined date. Finance Approval – if the Contract of Sale is subject to finance, every effort must be made by the purchaser to ensure that finance approval is obtained by the specified date. If by the specified date finance approval has not been granted, an extension may be applied for under certain circumstances. If the finance is subsequently declined, the Contract will end and the purchaser will receive a full refund of their deposit. However, the Contract of Sale becomes unconditional, if the vendor does not receive any written advice as to whether the buyers finance is approved or declined by the specified date. This means the purchaser will have to go through with the Contract whether finance has been approved or not. 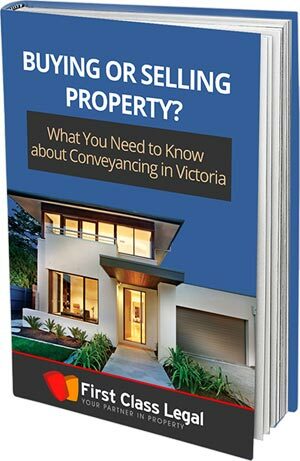 Conveyancing is the transfer of legal ownership of a property from one person to another. You may have the right to “change your mind” for a short period of time. If you intend to cool off, you must provide written notice of your intention to do so within three (3) clear business days from the date you sign the contract. There are exceptions to this right. These are listed on the front page of the contract. Buying at auction is a key exception. A covenant may be lodged by the original owner on a title and usually requires the land to be used in a particular way. For example, a covenant may require that only a single-story dwelling may be built, or that all buildings must be built of brick or brick veneer, etc. Usually 10% of the purchase price and paid when the Contract is signed. Disbursements are costs that we incur on your behalf in paying a third party for goods or services used to help with the conveyancing. In a conveyancing transaction, the costs of conducting searches for information about the property are the most common disbursements. These may include a title search, certificates showing things affecting the property such as proposals for roads and recent building permits and agent’s fees to attend settlement. If you are selling, we contact your mortgage lender and find out how much it will cost to discharge your mortgage. An easement is an area or strip of land on a property that is used by someone other than the landowner. It will be shown on your title and may be inside your property boundary. It is normally used for drainage, sewerage or electrical wiring. You are normally not allowed to build over easements but you can apply to the relevant authority to gain approval for any building works. A restriction or limitation on the Certificate of Title which may or may not be able to be removed. Encumbrances include: mortgages, charges, easements and covenants. If the Contract of Sale is subject to finance, every effort must be made by the purchaser to ensure that finance approval is obtained by the specified date. Any additional agreements made between the buyer and seller that are, recorded in the printed terms. Where there is a conflict between the printed and inserted terms, the inserted terms prevail. In the case of late settlement penalty interest will be incurred on the balance of the purchase price owing – generally agreements must be settled by 3:30pm on the settlement date. The legal description is taken from the property’s Certificate of Title. It generally includes the area in square meters (m2), lot number, the Deposited Plan of Survey and register reference. The document which is registered against the Certificate of Title where you grant to a Lender security over the property for a loan(s). A mortgage broker will organise a mortgage (loan) for you, providing you meet certain criteria. The person(s) giving a mortgage in favour of a Lender – called the mortgagor. First Class Legal will organise a Notice of Acquisition if you are buying a house. This will be forwarded to the appropriate State and Local authorities (council, water etc) upon settlement informing them of the change of ownership. If you are selling your house First Class Legal will organise a Notice of Disposition. This will be forwarded to the Local Council and relevant Water Board authority upon settlement informing them of the change of ownership. The survey plan of subdivision from which Certificates of Title are issued and easements are drawn and recorded. This may be actual physical possession by the purchaser. It also includes the situation where the purchaser has allowed a tenant into physical occupation in exchange for the right to receive rent from the property. “Property” includes land and buildings. The name/s listed on the property’s Certificate of Title are the registered owners or proprietors. Prior to a contract of sale being signed, a Section 32 Statement or Vendor’s Statement must be provided to a potential buyer. A Section 32 contains detailed information on council rates; charges affecting the property, location of any easements, zoning, restrictions and any building approvals given over the past seven years. If you are selling your property, First Class Legal will prepare your Section 32 Statement prior to the sale of your property. Settlement is the day on which the representatives of all parties, including any banks, meet at a prearranged time to exchange documents. Increasingly, settlements are happening electronically via PEXA (Property Exchange Australia). From 1 August 2019 all settlements will take place electronically. This statement shows relevant outgoings and incomings on the property including: rent paid or received, rates and the deposit paid. The State Government charges Stamp Duty whenever you purchase land. If you are borrowing money for your purchase, your lending institution will collect all Stamp Duty and registration costs. If you are using your own money for the purchase, we will lodge the documents on your behalf. A Statement of Adjustments is made before settlement to ensure that the Vendor pays their Local Council Rates and Water Rates and Land Tax (if applicable) right up until settlement date, with the purchaser paying from settlement date until the next charging period. A breakdown of payments made to all parties eg. council are included in the Statement of Adjustments. Joint Ownership/Joint Tenancy – is the most common choice. If the title is owned as joint owners, then each party has an equal share. If one of the owners passes away then all ownership is automatically transferred to the surviving party irrespective of what is stated in the deceased will. Tenants in Common is usually the choice of unrelated parties. If the title is owned as Tenants in Common, then each owner has a share in the property, shares can be in unequal shares and the Transfer is prepared under the purchasers instructions. In the event of one of the owners passing away, their share in the property goes to whomever they have directed in their will. When all the conditions of the agreement have been fulfilled or satisfied and notice of this has been communicated by the Buyer or Seller. The Seller of the house or property. Prior to a Contract of Sale being signed by a purchaser, the seller must provide the buyer with a Vendor’s Statement (also known as a Section 32 Statement). This document provides the buyer with certain information about the property such as: the zoning, services and rates. Please note a contract signed without first providing a Vendor’s Statement is voidable by the buyer. A statement containing certain matters of fact on which a purchaser can rely.